Have I mentioned that I love the new in colors from Stampin' Up!? I just love the soft and pretty colors. I used some of the new colors earlier this week, and continued with today's card. The talented Robbie, over @ Sketch Frenzy Friday has a wonderful sketch for you to try this week. I love how versatile these sketches are. I remember how overwhelmed I would feel, when I looked at sketches. I didn't always know where to start. So, I always feel some sort of obligation to help you 'see' the sketch. Thank you for your patience. For the 'star' see an object, like a blossom, a butterfly, or a star. For the 'banner' piece think a sentiment piece. As for the three lines across the card front, think of ribbon, scallop trims, ruffles, a torn edge, or any other type of divide. The card base is crumb cake card stock. The main panel is soft sky and natural ivory cardstock. I didn't have any new pattern paper, so I made my own, so to speak. I used the ledger stamp from The Open Sea stamp set, to create a little visual interest to the soft sky cardstock. I also used some white embossing powder to heat emboss the flourish from the Everything Eleanor stamp set. 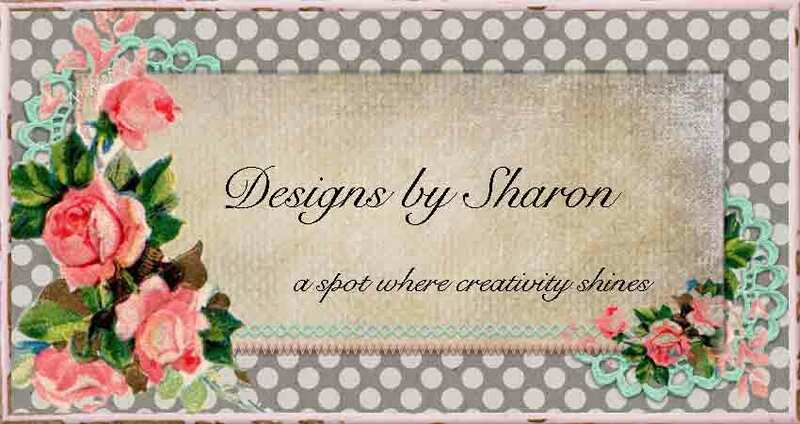 I used the Needlepoint Embossing folder to create the faux stitching and scallop trim border. 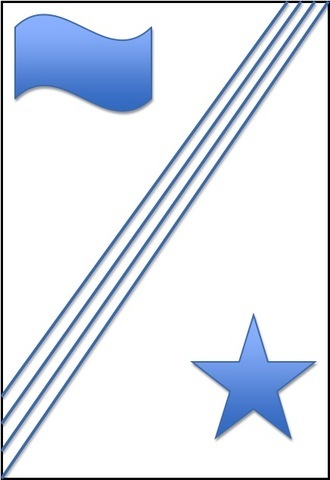 I made my own pennants. I used the polka dot embossing folder and the houndstooth embossing folder, floral stamp, music notes wheel, and the text wheel, to create the different pieces. I matted the pennant in crumb cake and used the natural ivory scallop pennant. I used calypso coral bakers twine to hang the pennants across the card front. I stamped a polka dot frame in soft sky. I love how soft this blue is. 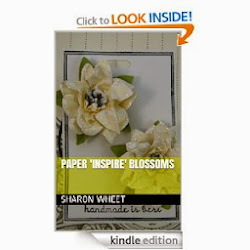 I stamped the flower onto crisp cantaloupe cardstock and heat embossed it. I used foam tape to lift the blossom off the card. I stamped the banner with the itsy bitty banners stamp set, in soft suede classic ink. I fussy cut the banner out. I matted it onto a scrap piece of soft sky card stock. I hope we have inspired you to play along with us @ SFF. We all have different styles, but that doesn't mean one is wrong or right. Just different, and hopefully inspiring. Play along, use our sketch, and lets see what you create! Wow, Sharon! Love your take on this sketch! Love the banners! How very creative you are!! Darling baby card! 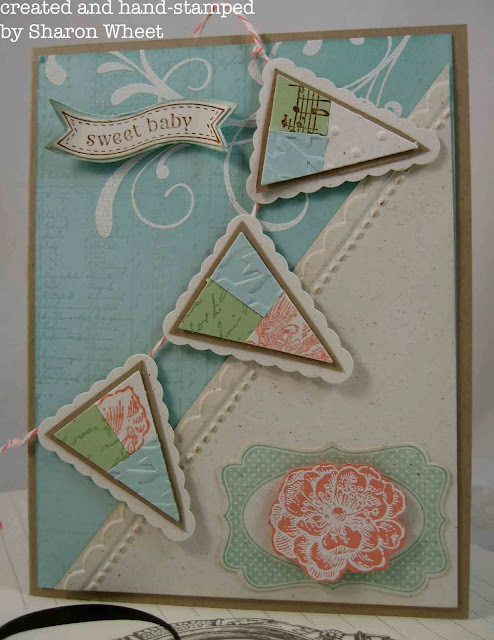 Love the pennant with different patterns of paper!